Let’s face it. The business of writing is tough. There is no ‘easy’ button to grow that fanatical fanbase that you know is out there. So instead you’ve been scrambling around trying to piece together the platform puzzle on your own, with little to show for it other than a lot of frustration and a dull throb behind your left eye. No well known author has made it to the top of the pile without some help. You may be able to figure it all out on your own, but why not grease the wheels with a bit of guidance from fellow writers, indie authors and marketing experts? Below is a list of smok’n blogs that produce some of the best, most relevant information on self-publishing, book marketing, entrepreneurship and platform building on the net. Take advantage of all the free and useful information these sites provide, bookmark the list for your go-to source on the topic, and share with other writers who could benefit from this resource. 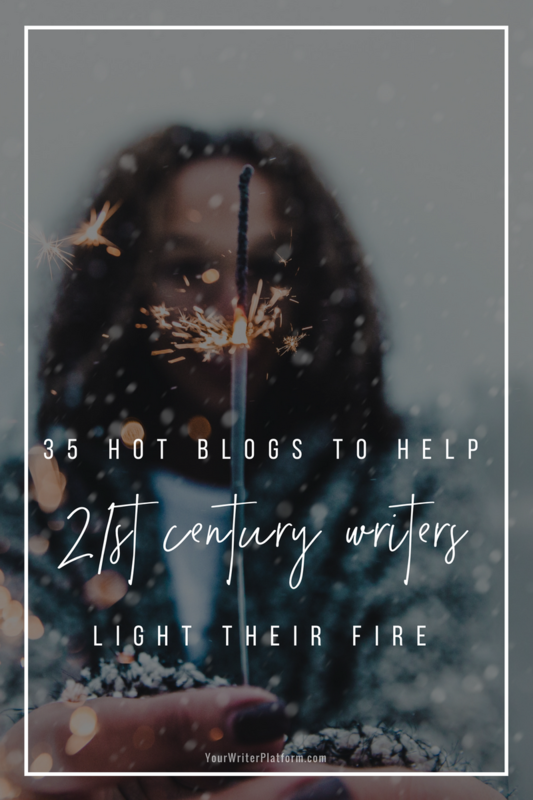 I hope this list is the spark that sets your ‘author-preneurial’ spirit on fire, and leads you to make connections that strengthen and grow your writing business. Indie author book marketing help times two. The Duolit gang: Shannon (the author) and Toni (the geek) share their experience and skills to help writers reach their publishing goals. Follow @Duolit on Twitter or connect with them on Facebook. Joel Friedlander provides a self-publishing roadmap for writers with articles, guides, resources and courses illuminating new ways for you to get your books into print and making them more apt to sell. Follow Joel @JFbookman on Twitter. BiblioCrunch helps connect authors and publishers with book publishing professionals to get new books and apps to market. The self-publishing blog provides authors with industry news, interviews, and publishing tips. Follow @BiblioCrunch on Twitter or connect on Facebook. Joe Bunting is the founder of the Write Practice and helps writers kick start their writing ‘practice’ and polish their skills. He provides practical tutorials and great articles with tips and techniques on improving your craft. Follow Joe @write_practice on Twitter or connect on Facebook. Joanna Penn is an author and entrepreneur. Her site includes a plethora of information in various forms of media on writing, publishing and book marketing. Follow Joanna @thecreativepenn on Twitter or connect with her on Facebook. Kristi Hines is a freelance writer, professional blogger and social media enthusiast sharing excellent blog marketing and blogging tips for professional bloggers. Krisiti also has a weekly series, Fetching Friday, featuring the best posts of the week in blogging, business, SEO, and social media. Follow Kristi @kikolani on Twitter or connect with her on Facebook. Author, blogger, blogging specialist and coach, Molly Greene blogs about indie author issues, and what she’s learned during her own self-publishing process. Follow Molly @MollyGreene on Twitter or connect with her on Facebook. A blog by Bryan Hutchinson filled with positive concepts and stories to encourage you as a writer. Bryan shares his experiences with writing, blogging, self-publishing and building a community online. Follow Bryan @ADDerWORLD on Twitter or connect of Facebook. Do you want to get inside the minds of your readers and find out what makes them ‘tick’? If so, Derek Halpern is your man. He breaks down psychological research and business case studies into simple, actionable steps that can help you improve your writing business and book sales. On the Book Baby blog you’ll find how-to’s, tips and resources on writing, self-publishing and marketing your book. Check out their free guides to get even more useful tips on the self-publishing and ebook marketing process. Catherine Ryan Howard is a writer, blogger and one of Ireland’s most successful self-published authors. She provides loads of great self-publishing advice and information for fellow writers. Follow Catherine @cathryanhoward on Twitter or connect on Facebook. The voices behind Wise Ink are Amy Quale and Dara Beevas, two editors, committed to empowering writers with valuable tools to publish wisely. On their site you’ll find practical tips, how-to’s, tutorials, and templates for writing, self-publishing, and book marketing. Follow Amy and Dara @Wiseink on Twitter or connect with them on Facebook. Seth Godin has written fourteen books that have been translated into more than thirty languages. Every one has been a bestseller. On his blog, Seth writes about marketing, leadership, art and the way ideas spread. Inspiring and thought provoking. Follow Seth @thisissethsblog on Twitter or connect with him on Facebook. With web design services and book marketing help, Author Media provides writers with support on blogging, writing, platform building and social media. Follow @AuthorMedia on Twitter or connect on Facebook. Carol Tice, creator of Make a Living Writing, provides writers with the tools they need to earn more from their writing. As she puts it in her tagline: “Practical help for hungry writers…” An especially good resource for freelance writers. Follow Carol @TiceWrites on Twitter or connect with her on Facebook. The personal blog of former Chairman and CEO of Thomas Nelson Publishers, Michael Hyatt. His articles on personal development, leadership, productivity, platform, and publishing are concise and highly actionable. As a published author himself, he provides insights from several sides of the industry. Follow Michael @MichaelHyatt on Twitter or connect with him on Facebook. Copyblogger founder, Brian Clark, has been teaching people how to create ‘killer’ online content for years. On the site you’ll find 5-6 articles a week about what’s working in online content marketing. It’s the most popular content marketing and writing blog on the planet. Follow Brian Clark @copyblogger on Twitter. Jane is a trusted resource for writers, and her site provides articles and resources on writing, industry news and the future of publishing. She has great advice on all things writerly, and gentle–but firm–recommendations on building your writing career. Follow Jane @JaneFriedman on Twitter or connect with her on Facebook. Mary Jaksch, Chief Editor of Write To Done has assembled a smorgasbord of guest bloggers offering guidance and direction for writers on the art and craft of writing. Write To Done was founded by popular super-blogger Leo Babauta of Zen Habits. A blog on writing, passion and creativity, Jeff Goins shares his views on what it takes to be a writer in the 21st century and includes resources tools and tips to get us going. Follow Jeff @JeffGoins on Twitter or connect with him on Facebook. Fantasy author, Lindsay Buroker, dispenses words of wisdom on everything from book marketing and self-publishing to interviews and success stories. Dan Blank, founder of We Grow Media, helps writers build their platforms, and works with publishers to grow their online communities. Dan offers advice on platform building, social media and blogging. Known for his transparency and authenticity, Pat Flynn provides real life case studies and recommendations based on his own experience with online business and blogging. His videos, podcasts and in-depth articles are amazing. Follow Pat @PatFlynn on Twitter or connect with him on Facebook. If you are looking for information on digital publishing, founders Denise Wakeman and Ellen Britt, have got you covered. Great articles on digital ebooks and all forms of digital content publishing (including videos, audio and interactive media). Author and marketing master, Danny Iny, provides tons of free training, videos and marketing advice as well as tips on building a community and developing a loyal audience. Follow Danny @DannyIny on Twitter. Insights, inspiration and practical advice for writers from C.S. Lakin–a novelist, a copyeditor, and a writing coach. She provides knowlegde and insight into the writing life. Follow C.S. Lakin @LiveWriteThrive on Twitter or connect with her on Facebook. Laura Pepper Wu (and her husband Brandon) provide writers with a wealth of popular articles, guides and more on writing, publishing and book PR. There is even some great free PDF guides to download and share. Follow Laura @LauraPepWu on Twitter or connect with her on Facebook. April L. Hamilton is an author, blogger, and a leading advocate and speaker for the indie author movement. She blogs about her experiences and adventures in both traditional and self-publishing. Follow April @indieauthor on Twitter. Want to know how to get more traffic (A.K.A. raving fans) to your author site? Want to know how to write epic ‘shitake’ and create something that matters? If your answer is yes and yes, then you need to check out Corbett Barr’s Think Traffic site. Follow Corbett @Fizzle on Twitter. Author J. A. Konrath’s opinions and pointers on writing, publishing and industry news. Follow @jakonrath on Twitter or connect with him on Facebook. Kristen is an author, freelance editor and speaker who takes a humorous approach to guiding writers through the maze of publishing, marketing and platform building. Follow Kristen @KristenLambTX on Twitter. Dana Lynn Smith teaches authors how to sell more books with articles and guides on book marketing, ebook publishing and social marketing. Follow Dana @BookMarketer on Twitter or connect with her on Facebook. A literary agent, Rachelle’s posts are a sneak peak into the mind of an agent, with tips, how-to’s and myth-busting lists to ease new authors into the publishing world. Follow Rachelle @RachelleGardner on Twitter or connect with her on Facebook. Nina Amir demonstrates the ease with which a writer can blog a nonfiction book. Fiction writers can use many of the same principles to blog novels as well, and Nina’s posts offer information based on her knowledge as a freelance nonfiction book editor, writing coach and consultant. Follow Nina @NinaAmir on Twitter or connect with her on Facebook. Author and freelance writer, Linda Formichelli provides freelancers with recommendations on how to develop a querying style that works, overcoming fear, getting motivated, and breaking a few rules along the way. Follow Linda @LFormichelli on Twitter. If I’ve missed a site that you feel should be in the mix, please let me know in the comments below. Wow, this is a really comprehensive list, Kimberley! I’m definitely bookmarking this one. Thanks so much for putting this together. What a terrific list of resources for writers! I’m honored to have The Savvy Book Marketer included and I’ll be sharing this link with my followers. Thanks for making your site such a valuable resource to the writing community, Dana! Glad you like the list and I appreciate you sharing! Great list, I’ve found quite a few new sites! Thanks for sharing! http://terribleminds.com/ramble/blog/ is another great one that keeps me inspired to write! Hi Meg! Glad you’ve found some new sites to cruise! And you’re right, Chuck Wendig is great (and funny)! Thanks for commenting! Fantastic list, Kim! Lots of new sites for me to check out. Thanks so much for the 30 Day Books mention, we truly appreciate it. Thanks so much for including me with so many other wonderful blogs and bloggers! I’m honored. I might mention that I also have another blog for writers: http://www.writenonfictionnow.com. You and your readers might enjoy that as well. Best of luck to you, and thanks so much for your kind words. Thanks for the compliment, Dara! Wise Ink’s inclusion in a list of top blogs in this area is well deserved. Glad you found a few more excellent sites to add to your cache! This is my personal list of the ‘best of the best’, and blogs that I actively read or am subscribed to. They are in no particular order, and for me, each site is unique and has something distinctive to offer. Because I believe that writers are professionals, I have also included in the mix a few non-industry specific sites (Think Traffic, Firepole Marketing, Social Triggers, Smart Passive Income). Leveraging ideas, insights and best practices from industries outside the writing industry (marketing and small business, for example) can give the modern writer an unmistakable advantage. Thanks for the comment, Amit! Kimberley, thanks for including The Future of Ink on your list. Lots of fabulous blogs on this list and we’re honored to be included. Blog on! No problem, Denise! Keep up the great work you’re doing at TFOI! Very useful and an extensive list. I especially found it useful because besides the usual suspects like Seth Godin, there were several people here that I haven’t come across before. Actually, I’m a subscriber to a few of these that I haven’t put on my own list. Thanks for the reminder. Glad to help, Dariel! These people work really hard to make it easier for us writers, so if you add them to your list of favourites, let them know. I’m sure they would appreciate it! Two that I follow (and know the authors) are trained writers and bothhave written books. Suzan St Maur has a website & blog called http://www.howtowritebetter.net/ She blogs everyday about writing and has MANY of her own published books (I have 2 of them). The other is Barb Sawyers of http://www.stickycommunication.ca/ (I have her book). They’re both great 🙂 Check them out Kimberley! P.S. Love the name ‘sticky communication’! Loads of high-quality choices here, Kimberley. If it weren’t for RSS feed readers, I don’t know how would follow them all. Thanks for stopping by, Kevin! As writers, we sure can’t complain about there being a lack of quality resources available for us to learn from. Hopefully you’ve found some new sites to add to your feed reader! Really useful and comprehensive list and resource! Thanks for taking the time to put this post together! You bet, Deevra! Hope you found some new resources to add to your toolbox! Sophie Lizard at http://beafreelanceblogger.com offers some terrific advice and money making tips for aspiring bloggers on a fairly regular basis. Thanks for the recommendation, Jessica! You know, I just stumbled across Sophie’s blog while participating in Carol Tice’s May link party, and it does look great! You’ve got a great list that’s missing my favorite by Victoria Mixon: author, editor, writing instructor, and all around funny lady – http://victoriamixon.com/ Keep up the good work Kimberley !